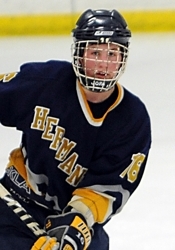 Junior defenseman Jared Kolquist is already in his third season of starting for Hermantown (Photo by Helen Nelson). 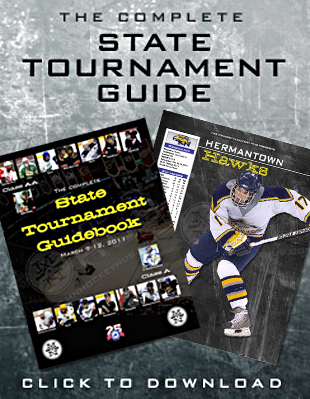 While the rest of Hermantown was celebrating the Hawks’ second-place finish in the Class A state tournament last March, a question kept nagging at longtime coach Bruce Plante. “We were kind of wondering where we were going to get our players from (this year),” Plante jokingly recalled Monday. Such is the life of a hockey coach. 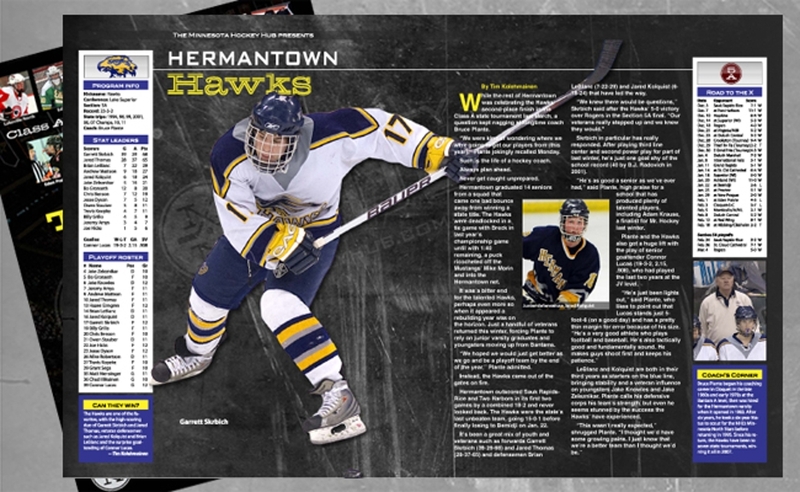 Hermantown graduated 14 seniors from a squad that came one bad bounce away from winning a state title. The Hawks were deadlocked in a tie game with Breck in last year’s championship game until with 1:40 remaining, a puck ricocheted off the Mustangs’ Mike Morin and into the Hermantown net. It was a bitter end for the talented Hawks, perhaps even more so when it appeared a rebuilding year was on the horizon. Just a handful of veterans returned this winter, forcing Plante to rely on junior varsity graduates and youngsters moving up from Bantams. “We hoped we would just get better as we go and be a playoff team by the end of the year,” Plante admitted. Instead, the Hawks came out of the gates on fire. Hermantown outscored Sauk Rapids-Rice and Two Harbors in its first two games by a combined 18-2 and never looked back. The Hawks were the state’s last unbeaten team, going 15-0-1 before finally losing to Bemidji on Jan. 22. It’s been a great mix of youth and veterans such as forwards Garrett Skrbich (39-29-68) and Jared Thomas (28-37-65) and defensemen Brian LeBlanc (7-22-29) and Jared Kolquist (6-18-24) that have led the way. “We knew there would be questions,” Skrbich said after the Hawks’ 5-0 victory over Rogers in the Section 5A final. “Our veterans really stepped up and we knew they would." Skrbich in particular has really responded. After playing third line center and second power play for part of last winter, he’s just one goal shy of the school record (40 by B.J. Radovich in 2001). “He’s as good a senior as we’ve ever had,” said Plante, high praise for a school that has produced plenty of talented players, including Adam Krause, a finalist for Mr. Hockey last winter. Plante and the Hawks also got a huge lift with the play of senior goaltender Connor Lucas (19-3-2, 2.15, .908), who had played the last two years at the JV level. LeBlanc and Kolquist are both in their third years as starters on the blue line, bringing stability and a veteran influence on youngsters Jake Knowles and Jake Zeleznikar. Plante calls his defensive corps his team’s strength, but even he seems stunned by the success the Hawks’ have experienced. The Hawks are one of the favorites, with the high-scoring duo of Garrett Skrbich and Jared Thomas, veteran defensemen such as Jared Kolquist and Brian LeBlanc and the surprise goaltending of Connor Lucas. Bruce Plante began his coaching career in Cloquet in the late 1960s and early 1970s at the Bantam A level, then was hired for the Hermantown varsity when it opened in 1983. After six years, he took a six-year hiatus to scout for the NHL’s Minnesota North Stars before returning in 1995. Since his return, the Hawks have been to seven state tournaments, winning it all in 2007.